Arthroscopic surgery is used to diagnose and treat many joint problems. This significant advance in joint care allows for a rapid return to improved activity. Most commonly used in knees, shoulders and ankles, the arthroscope can also be used for the spine, hips, wrists, and elbows. 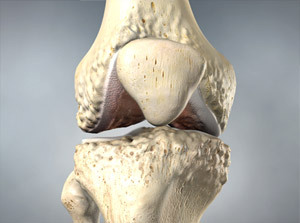 This animation shows the knee joint. Knee pain or Knee injury? Dr. Darren Keiser can help! 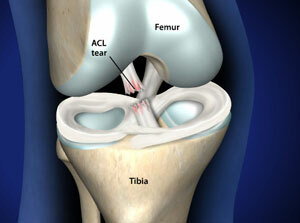 To begin the procedure, the surgeon will make a few small incisions, called “portals,” in your knee. A sterile solution will be used to fill the knee joint and rinse away any cloudy fluid. This helps your orthopaedic surgeon see the structures inside your knee clearly and in great detail. Your surgeon’s first task is to properly diagnose your problem. 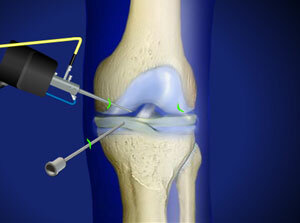 He or she will insert the arthroscope and use the image projected on the screen to guide it. If surgical treatment is needed, your surgeon will insert tiny instruments through other small incisions.